New cat owner? Or just looking for tips on how to best care for your kitty? You have come to the right place! I have been a cat mama for nearly 20 years and have learned a lot along the way. Today I would like to share some essential cat care tips. Follow these cat care tips and your cat will look and feel great! Spend time daily playing with your cat. Pick up some cat toys from Walmart and spend some time each day playing with your kitty. Play time is a great way to getting your cat some exercise while also spending some quality time bonding with them. 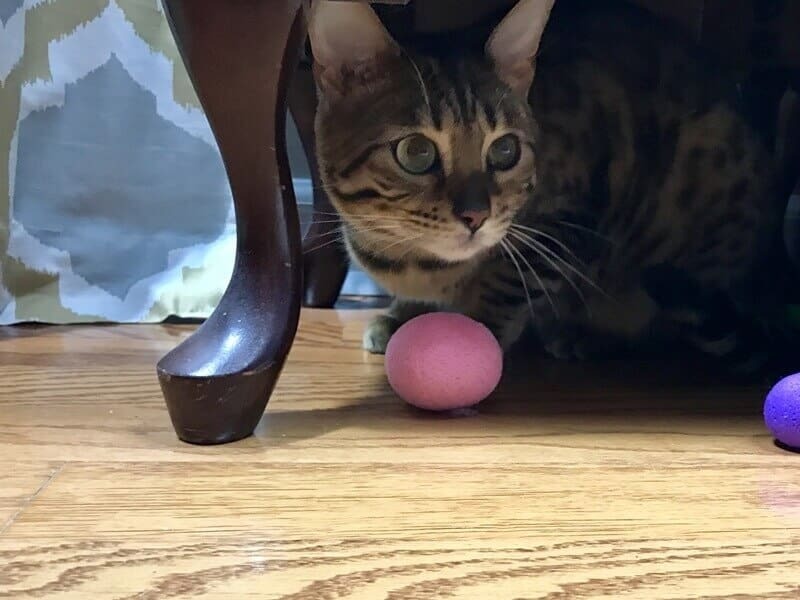 Cat toys don’t need to be complex and expensive, some of the best cat toys are the simplest ones, such as a ball or a feather hanging from the end of a stick. Provide cat friendly spots around the house. Kitties love napping. Provide your cat a soft and snug cat bed that they can nap in and they will love you for it. Many cats enjoy looking out the window, so setting up a window seat allowing your cat to look out the window will also be appreciated by your fur-baby. Cats like to scratch, so be sure to invest in a scratching post for each level of your home. This will help to save your furniture by providing kitty an appropriate place to dig in their claws. Cats also enjoy climbing, which is why cat trees make great additions to any home with a cat. Cat trees often include places to climb, scratch, and nap, making them a great all-in-one activity center for your kitty. Set up litter box and scoop daily. The general rule of thumb is that you should set up 1 more litter box than there are cats in your home. For example, if you have 2 cats you should set up 3 litter boxes. I would also encourage you to set up a litter box on each floor of your home. This allows for your cat to always have a nearby place to do their business. Be sure to scoop your litter boxes at a least once per day. Cats like to use a clean litter box and have been known to go on a “litter box strike” (i.e., do their businesses elsewhere in your home) if their box isn’t up to their cleanliness standards. Trust me, it is better to avoid any trouble and just keep the litter box clean and tidy in the first place. 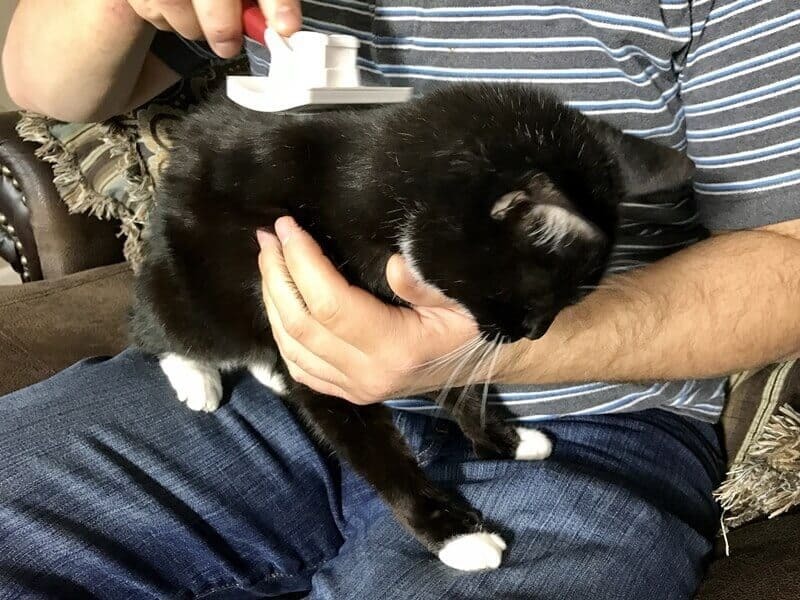 Cats are great at keeping themselves clean, but they do require some pampering from their humans. Weekly brushing sessions will help keep your short-haired cat’s fur nice and silky. Long-haired cats should have their fur brushed daily to keep it from knotting. Your cat’s nails will need to be clipped about once every two weeks. Use a special nail clipper designed for cats and be sure not to clip any of the “quick” – the pinkish bottom part of the nail. Only the white tip of the nail should be trimmed. When it comes to clipping kitty’s nails, it is better to be on the side of caution and cut too little than cut too much. Bring your cat to the vet. When it comes to your cat’s health, the key is not skimping on vet visits. Healthy check-ups and keeping kitty’s shots up to date is the first step in keeping your cat healthy. Bring your new cat in for a checkup as soon as you can, and then keep up with your vet’s recommendations of a schedule for visits. Feed your cat a healthy cat food. It is important to feed your cat a healthy and nutritious cat food. Cats need a diet high in protein to give them energy and help support their lean muscles. 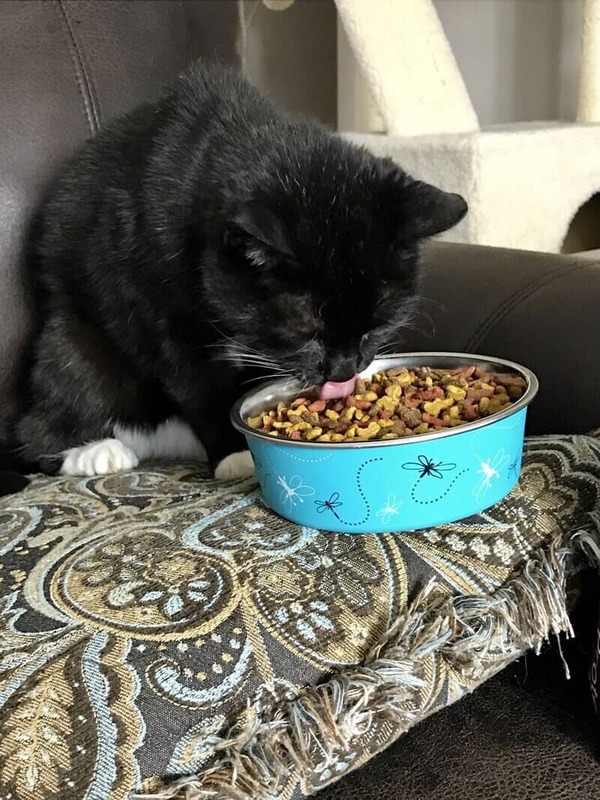 9Lives Protein Plus is a great choice of a nutritious cat food for adult cats (1+ years). Made with wholesome ingredients, 9Lives Protein Plus is packed with 33 grams of high quality protein (per 100g of food) and contains antioxidants for healthy immune system support. 9Lives Protein Plus is very affordable and can be purchased at Walmart. I choose to feed my cats 9Lives Protein Plus because I know it provides them the nutrition that they need. 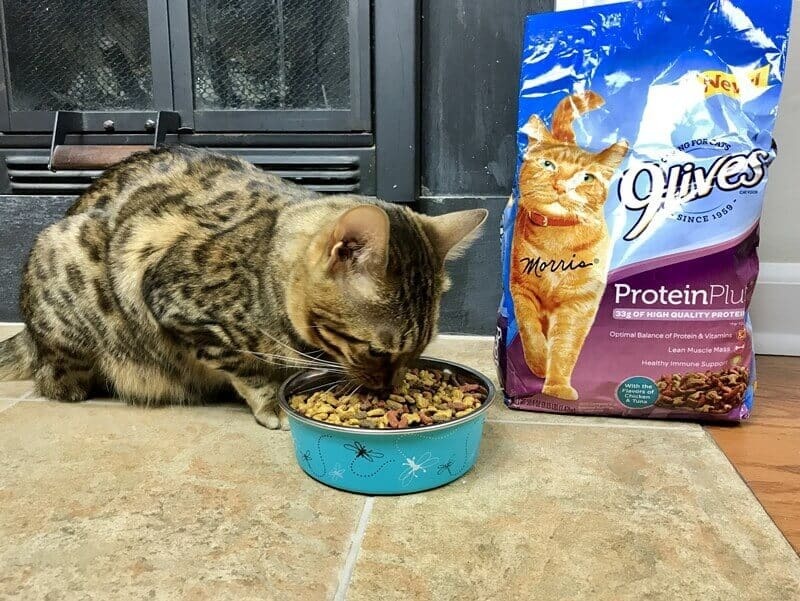 Like 9Lives’ handsome and spunky mascot Morris, my cats love 9Lives Protein Plus’ delicious tuna and chicken flavor! 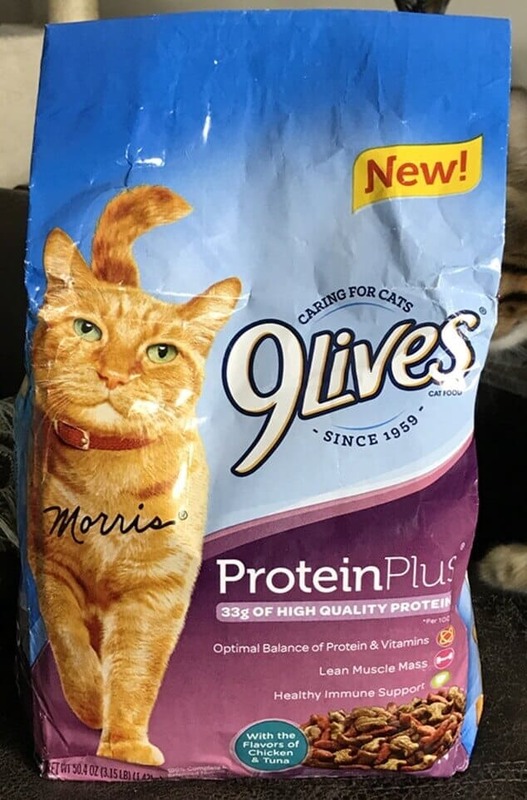 I picked up our package of 9Lives Protein Plus at Walmart when I was doing my other grocery shopping. I love shopping at Walmart because it is both convenient and affordable. There you have it – 6 essential cat care tips! I hope that these tips help you keep your kitties looking and feeling great! Be sure to keep up with Morris the Cat by following him on Instagram, Facebook, and Twitter. I ADORE cats, and playing with them and spending quality time is so important. Mental stimulation is big for all animals! So many people I know get a cat and then just ignore it. Usually letting it roam outside. That’s no life for a pet. All excellent tips for any cat owner to keep in mind, whether new or seasoned. I had no idea kitties needed any assistance in the grooming department and thought they took care of everything on their own. Great info! I am definitely a cat person, so count me in to play with cats when we’re visiting friends and family with cats. And snuggles too. The others are really great tips too! Grooming your pet is important and it makes them happy! I don’t have a cat but our dogs HAVE to be groomed regularly. Thanks for the great tips to keep my cat happy and healthy. I learned that I probably need to spend more play time with my cat for exercise and bonding. It’s so important to really think about taking care of an animal before you get one! Thank you for sharing your great tips. Taking on a new pet involves so much that can be time consuming and expensive. We truly have to be responsible pet owners and care for them as a member of the family! I miss having a cat, but three of us are allergic! I never thought we’d have a cat but we do, he’s grown on us. 🙂 These are some great tips, thanks for sharing. Great tips, I had my wife read this and she actually learned something and she knows almost everything there is to know about taking care of cats. Great tips..I love the one of providing cat friendly spaces in the home. Great idea! Thanks for sharing. I am such a cat girl- They are the best. Thanks for the tips! I’m pretty sure that most weeks I spend more on the cats than I do on myself. They always have grain free food and lots of treats. They also have more toys than any pets I know although they like to play with bottle caps the most.